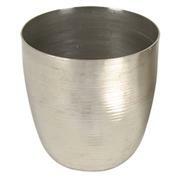 Nickel crucibles constructed from pure heavy sheet nickel. They are suitable for fusions, including those with sodium peroxide, and are highly resistant to dilute alkalies. Flat-style nickel crucible covers with depression in center for centering on crucibles. Extension on one side for handle.